"Start your holiday shopping early! 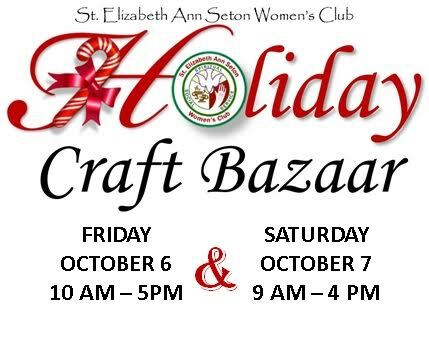 The St. Elizabeth Ann Seton Holiday Craft bazaar is taking place on Friday October 6, 2017 10 a.m. to 5 p.m. and Saturday October 7, 2017 9 a.m. to 4 p.m. The event includes handmade crafts and unique gift items. Our Seton cafe will be open for snacks, lunch and drinks throughout the day." For more information, visit their website or contact their event coordinator at seasbazaar@gmail.com.